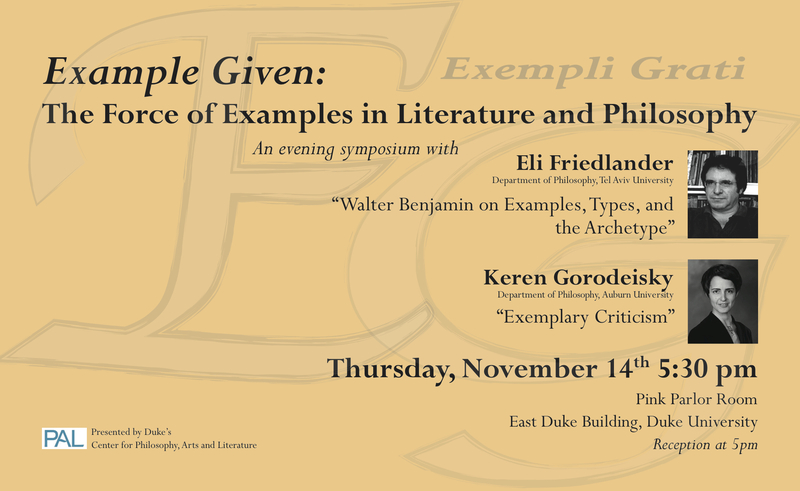 PAL welcomes Eli Friedlander, Philosophy, Tel Aviv University, and Keren Gorodeisky, Philosophy, Auburn University, to a Mini- Symposium to explore the use of examples in Philosophy and Literature. There will be two presentations, with refreshments, and time for questions. The problem of the critic, as of the artist, is not to discount his subjectivity, but to include it; not to overcome it in agreement, but to MASTER IT IN EXEMPLARY WAYS. Then his work outlasts the fashions and argument of a particular age. That is the beauty of it.